Apple CEO Tim Cook and select executives will reportedly visit Turkey in February to discuss a potential iPad in education deal worth over $4 billion, while saving time to stop by the country's first brick-and-mortar Apple Store. Turkish Prime Minister Recep Tayyip Erdoğan visits Apple's Palo Alto HQ in May. According to Turkish language publication emlakkulisi.com (machine translation), Cook will be in Turkey next year to meet with President Abdullah Gül over the country's so-called "FATIH Project," which seeks to replace blackboards and textbooks with modern computing devices. 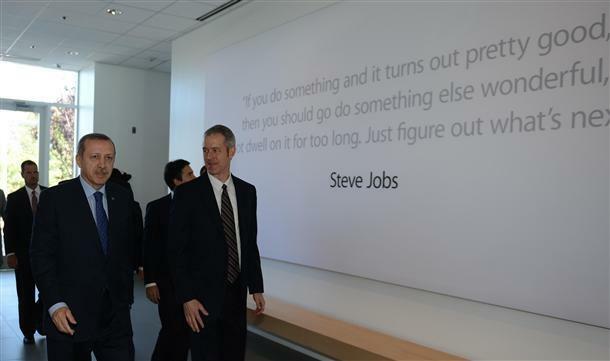 In May, Turkish Prime Minister Recep Tayyip Erdoğan visited Apple headquarters to inspect the tech giant's latest technological advancements before putting out a bid for his FATIH project. The program's initial phase calls for the acquisition of 10.6 million tablets and could be followed by another purchase of between 2 to 2.5 million iPads. In total, the initiative is scheduled to roll out over a four-year period and is expected to cost between $3 and $4 billion. Along with the presidential meeting, the publication claims Cook is also planning to visit Turkey's first Apple Store in Istanbul's Zorlu Center, which is set to open early next year. The over 21,500-square-foot location is said to feature an all-glass cube-like cap structure similar to the famous Fifth Avenue store in New York. Apple is continuously pushing beyond established markets like the U.S. and Europe, apparently concentrating efforts on developing economies. Istanbul's brick-and-mortar Apple Store will be Apple's second official retail presence in Turkey, following October's debut of the Turkish Online Apple Store.